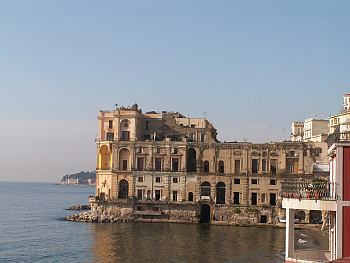 The building is on the site of the so-called "Rocks of the Siren" and, indeed, was originally called "La Villa Sirena". It changed hands a number of times and finally was inherited in 1630 by the woman whose name it now bears, Anna Stigilano, who then married the Spanish viceroy of Naples. She had the building redone by the great architect, Cosimo Fanzago, in the 1640s and, since that time, the building has been called Villa Donn'Anna.